KANSAS CITY, Missouri (Reuters) – Most of its residents left, the school closed, the city government was disbanded and starting this week nearly every commercial building in Picher, Oklahoma, will be demolished. 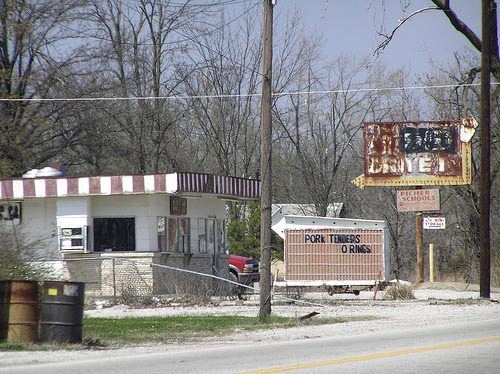 But the owner of the last-remaining open business in Picher, which has been vacated over the years because of lead contamination, is not ready to go. “It’s not time for me to leave yet,” said Gary Linderman, owner of Old Miner’s Pharmacy in what is left of central Picher, located in the northeast corner of the state. In addition to providing prescriptions, the pharmacy is the only place left in town to buy snack food, beverages, over-the-counter medicine and other necessities. Linderman declined a buyout from the federal government, which declared Picher a hazardous waste site in 1981 and has bought out about 900 homeowners and businesses. Crews demolished a funeral home, restaurant, thrift shop, apartment building and other structures this week, with more to come. Besides lead contamination, Picher has suffered in recent years from sinkholes from old mines that threaten to swallow the community. Three years ago, a tornado destroyed about 150 homes, chasing more people away. Picher’s population has shrunk from 1,640 in 2000 to only a handful of residents today. The school district and city government dissolved in 2009 and the post office closed. The town had more than 14,000 residents in the 1920s. Because of historic significance, a church, mining museum, auction house and a building where mining equipment was sold will remain standing, though they are abandoned. Linderman’s building will be surrounded by vacant lots in what used to be downtown, but he doesn’t seem to mind. Previous: Charlie Sheen has been hospitalized! Next: Miley Cyrus Voted Worst Celebrity Influence!